Cho-Liang Lin’s recent concerto recordings seem to have concentrated on contemporary music with disc of solo works by Tan-Dun, Yi and Christopher Rouse. There does seem to be an element of personal preference in this, rather than just the vagaries of the recording process. But Cho-Liang Lin has recorded many of the great classics, even if his recordings have had a tendency to drop out of the catalogue. So it is perhaps not surprising to find him headlining this new recording of Vivaldi’s The Four Seasons from Naxos. When presented with a disc such as this, there is a tendency for the reviewer to wonder whether we need yet another recording of such a commonly occurring work. But inevitably Cho-Liang Lin, like most performers, would wish to lay down for posterity his own version of this iconic work. His companions are Sejong and the harpsichordist Anthony Newman. Sejong (previously known as the International Sejong Soloists) is a string ensemble formed in 1995 in New York. It consists of a group of some sixteen highly talented string virtuosi, some playing on instruments such as Guarneri del Gesu and Stradivarius violins. On this disc Cho-Liang Lin plays on the 1715 Stradivari “Titian”. From the very opening notes of Concerto No. 1, “La Primavera”, the performers demonstrate their credentials. Playing is crisp and highly articulated with a brilliance and edge that is almost diamond hard. The string sound is vivid but in the faster sections has a tendency to aggressiveness. There are no doubts, however, that this is a virtuoso ensemble. Speeds are relatively swift, but in the slower movements the performers allow the music time to register and don’t skate over things. As regards the soloist, Cho-Liang Lin is a highly efficient performer, giving a virtuoso performance that is well articulated and quite impressive. Unfortunately I found that his playing also seemed lack warmth and seemed rather unlovable. Kyung-Wha Chung’s 2001 recording and Mutter’s 1999 are the two most recent contenders as far as modern instrument recordings of The Four Seasons are concerned. In his Gramophone review of Chung’s recording, Edward Greenfield commended the performance for its warmth and the feeling of music-making between friends. It is this warmth and friendliness that I missed. Both soloist and ensemble seem to be concerned with the technique required to produce the necessary virtuoso brilliance. Somewhere along the way warmth and fantasy seem to have been lost. Also, I did not feel a strong sense of story telling. Surely the popularity of these works is not just on account of their tuneful but because each concerto has a recognisable story line. To their credit, Cho-Liang Lin and Sejong fill the remainder of the disc with the other two named concertos from Vivaldi’s Op. 8 set, La tempesta di mare and Il piacere. These works are less recorded and it is delightful to have them on this disc. It is probably my imagination but I felt that the performances audibly relaxed as soon as La tempesta di mare started. As if the performers were able to enjoy themselves in the lesser known works where the pressure of expectation would be less. I am unclear who directed these performances and perhaps that was the problem, not every virtuoso has the personality required to impose himself or herself as the director of a performance. And Anthony Newman is credited simply as harpsichordist. Perhaps the recording would have had more character if a single conductor had been in charge. One curiosity is that Newman plays continuo on harpsichord and organ. Period practice seems a world away on these discs but I feel that the organ sounds wrong against the strings. As is often the case with modern instrument recordings of baroque music, the harpsichord sounds rather underpowered. Playing time is a little short and I did wonder whether the group could have given us a further concerto from Vivaldi’s Op. 8. 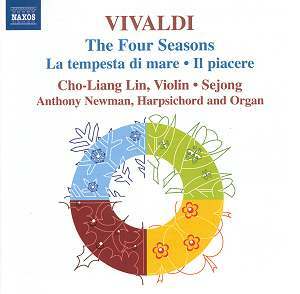 If you are looking for a bargain version of Vivaldi’s The Four Seasons, then you need look no further than this disc. Here are efficient, well played virtuoso performances with two extra concertos thrown in. But if you are looking for love, warmth and a feeling of friendly communal music making, then look elsewhere.